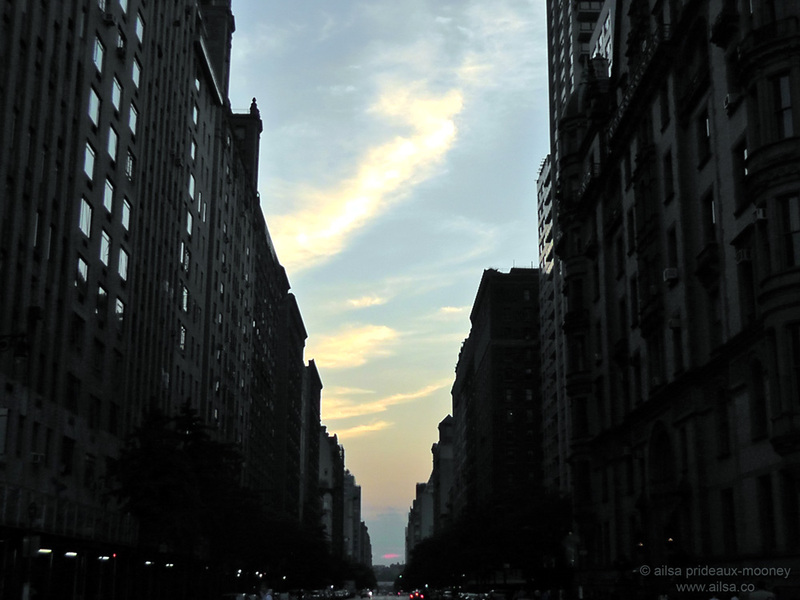 Manhattanhenge | Where's my backpack? Yes, I missed the Supermoon because of fog, and the Transit of Venus because of cloud cover, but tonight was going to be different. 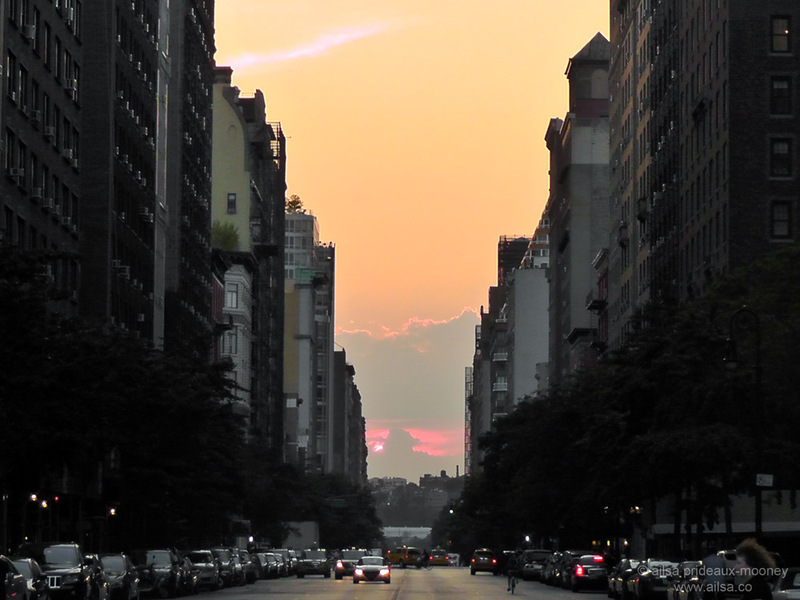 Tonight I was going to see Manhattanhenge for the very first time. 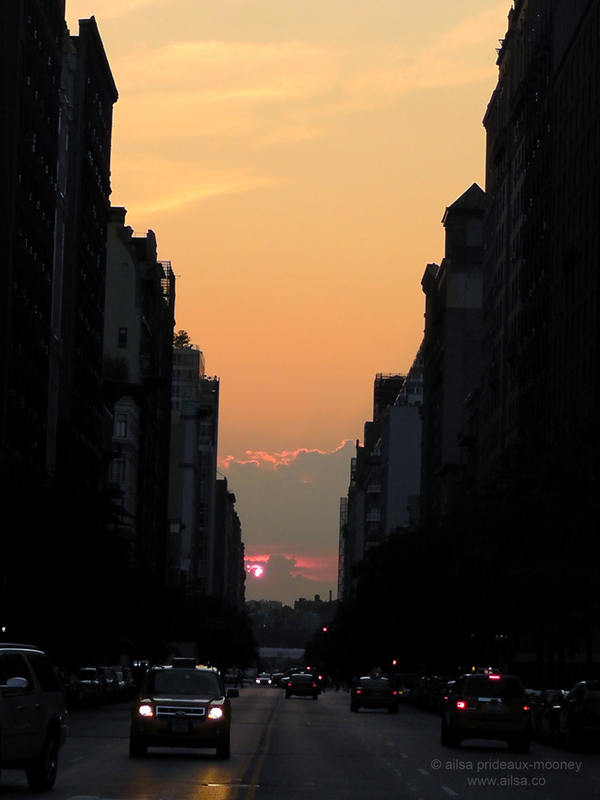 Manhattanhenge, for the uninitiated, is a phrase coined by the director of the Haydn Planetarium, Neil deGrasse Tyson, to describe the perfect alignment of the setting sun with Manhattan’s grid. It happens twice a year, and for ten minutes on those two very special days, you can see the sun set right in between the towering skyscrapers of wider streets such as 14th, 34th and 42nd Street as you look towards Jersey. Yesterday, the full sun set on the grid – but I couldn’t see it because I was doing a show as the sun went down. Tonight, however, I had the opportunity to watch the half sun on the grid so I arrived early and bagged my spot to watch the spectacle. The sun glinted along the buildings as it began its descent. Are you kidding me? Not again. Noooooo! This is what it looked like yesterday, when I wasn’t there. If I had been there, I’m almost certain that cloud cover would have obscured it. This entry was posted in New York, Photography, Travel, United States and tagged new york, photography, photos, pictures, postaday, travel, writing. Bookmark the permalink. Ahhh! Sorry you missed it. Maybe next time. Still wonderful photos. 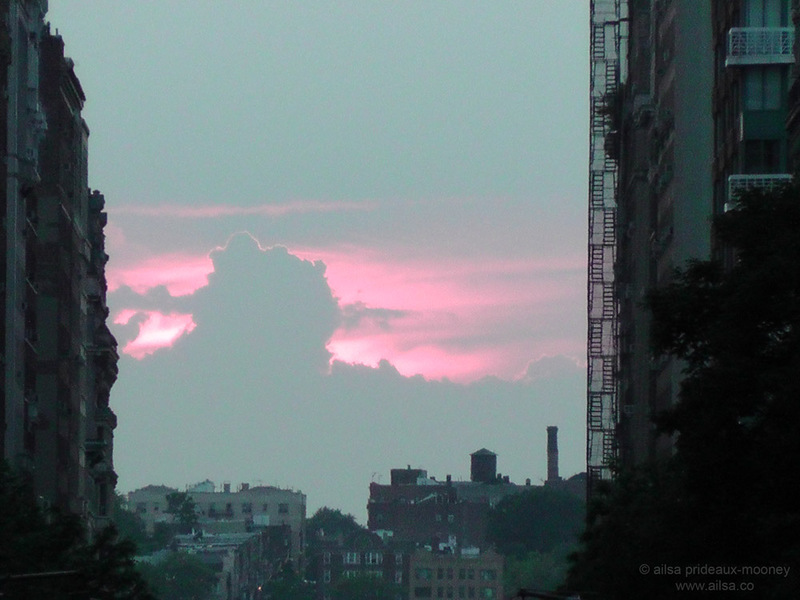 The sky did turn some lovely colours, but those dastardly clouds just had to show up at precisely the wrong moment. poor you!! try a lucky charm next time! Ha ha! In India, you would have been told it was your “Karma” 😀 Gorgeous photos nevertheless! Maybe you need to focus on spectacular clouds instead! The weather might just be foxed and the sun/planets do the right thing for you! Perhaps you’re being saved for something special, a cosmic event that only you will capture… And all this practice will make it the perfect photo. Is that what the Indians called it? I didn’t know. 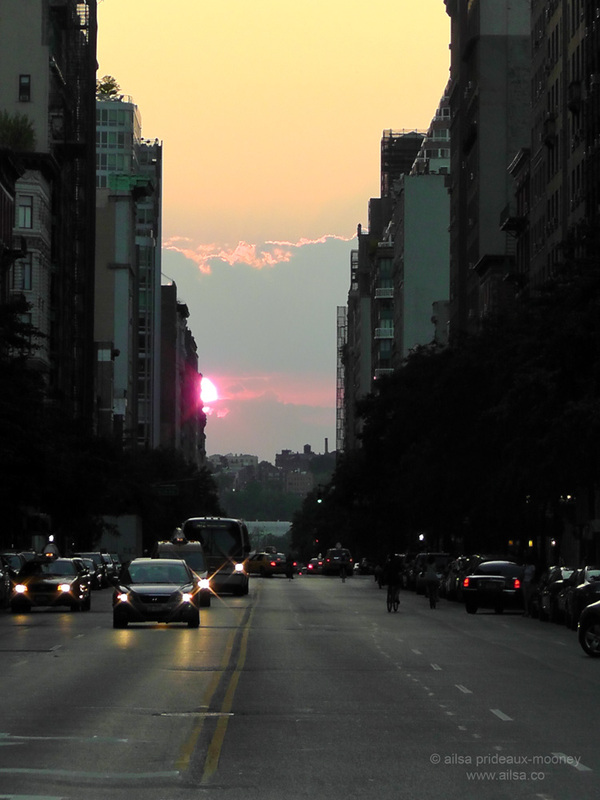 Manhatttanhenge. The things I learn about through blogs ^^ Thanks for the share! I perfectly understand you. Every time when there’s a Moon eclipse, оr Meteor shower or anything like that, they are clouds on the sky! I am joking that I can predic the weather for a certain place if I know that I’ll be there when there’s Venus transit for example, and for sure the sky will be cloudy. Although I catched the last Supermoon and once a solar eclipse. 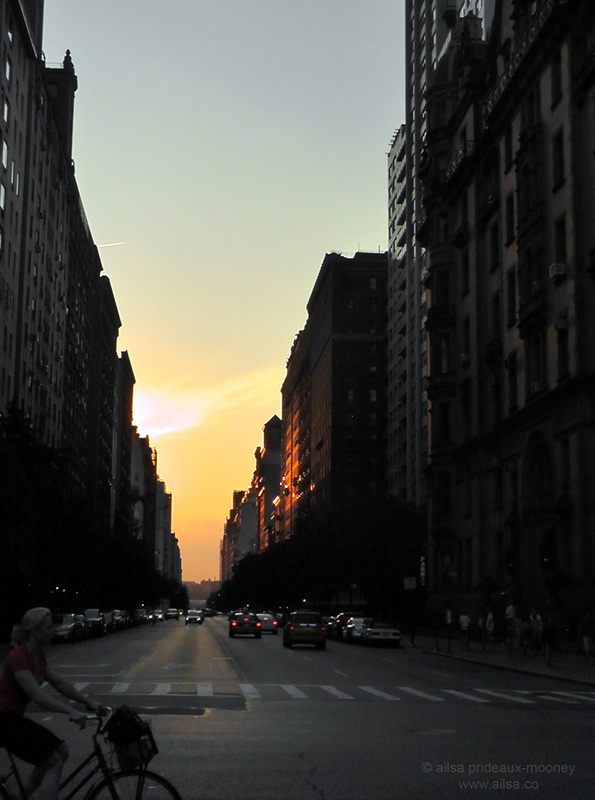 But still your photos of almost Manhattanhenge are very beautiful. I’m pretty sure it’s just a sweet photo opportunity for New Yorkers, c & c – as far as I can tell, they don’t indulge in sacrificial offerings – although darting in front of yellow cabs to get a photo might inadvertently bring one about! Still some very beautiful photos and something I’d never heard about! Oh, sorry the weather gods weren’t on your side. Good pics though. There is a place near my house where I want to take a photo of the sun rising over some rapids in a creek. I’ve calculated the dates — and for one I was out of town, the other day it rained. Maybe next year…. Beautiful shots you did, Ailsa! 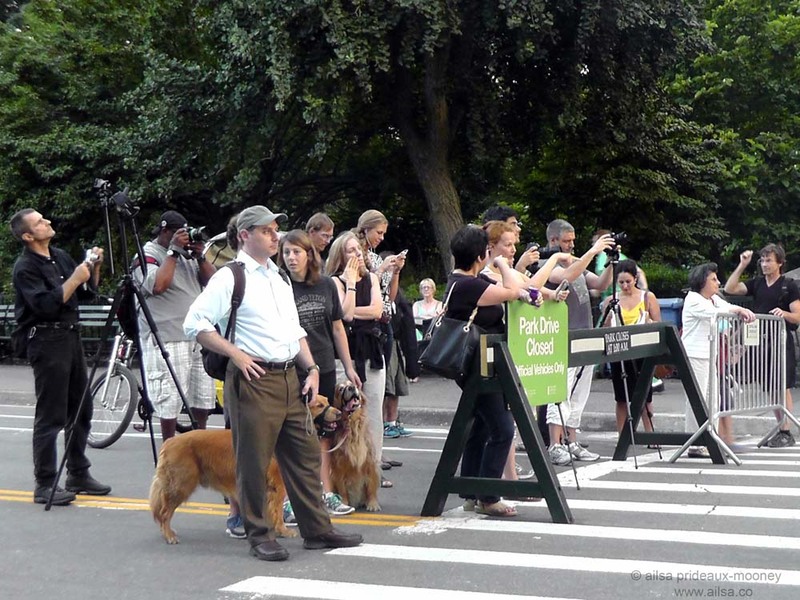 Manhattanhenge on the video is phenomenon. Thanks! This is so cool! I’ve never heard of such a thing! What kind of shows do you do? Theater, tv? How fun! The weather, wild animals – impossible to predict, but even the dud shots usually have magic to them – as did yours, Ailsa. I tell you what, though, that Neil deGrasse Tyson is doing great things for New York and the Planetarium, isn’t he? I’ve only seen him talking about the reclassification of Pluto, but his name keeps popping up about all sorts of things. I’ll remember that about navigating by sea – northern hemisphere only, or both north and south? How clever of you! Wow, I had no idea such a thing existed. Definitely something I’m going to look up next time I’m in New York, just in case! Definitely, Silken, it’s quite an event. It can get pretty crazy along 42nd and 34th Street, with people stopping traffic to snag the perfect shot. It’s a lot of fun, and quite a spectacle. I’m sorry I missed it… Maybe next year.The pictures are quite lovely. Oh no figures huh! In Shanghai the WFT, or bottle opener, has a rectangular opening. I guess there is a day or 2 the sun is right in the middle of it. I would love to get that shot, but so much smog and lack of locations to see this make it pretty difficult. I feel your pain since I just bought a new camera last week and I have missed the sunset everynight since! Clouds… clear all day until sunset and thick clouds JUST block the horizon! It is the tallest building in Shanghai, but won’t be for long. Another building is 3/4 way done and will be taller by a few floors when completed. I’ll look and send you the links to previous posts I did with the ‘bottle opener’. Please do, CTB, I’d love to see them. will do when I get back… remind me so I don’t forget. Have a wonderful time in Cuba! Kidding! You’re welcome any time! Pingback: Travel theme: Silhouette | Where's my backpack?